Chocolates, cherries and grapes are not good food options for your dog. Check out other foods to avoid, plus some that are great for your four-legged friends. Wondering what human foods dogs can eat? Think twice before sharing your lunch with your dog. You may be doing more harm than good when it comes to Fido’s long-term health. And, as always, check with your dog’s vet to get expert advice. What are some foods dogs can eat? There are many misconceptions about which foods are safe for your dog to eat and which are not. Many foods are considered good while others are considered bad or harmful for their health. When it comes to dog food, you shouldn’t always think of meat. Your pet can also be allowed to enjoy some fruits. But with so much misinformation, it can be difficult to make safe decisions about what your canine friend should eat or not. Consider giving the following healthy foods to your dog. It is important that these foods dogs can eat are fed only in small amounts. Apples make nutritious, fiber-rich snacks for dogs. The fruit is rich in antioxidants and fiber and low in protein. It is especially ideal for consumption for dogs that have certain illnesses that require limiting high-protein food intake. Apple also makes an excellent food for senior dogs due to this reason. The vitamins in the fruit help your canine friend in fighting degenerating conditions while the fiber content helps improve gastrointestinal health. Make sure to remove the core and seeds when feeding apples to your dog. Your pet can eat bananas, but only in moderation. The fruit is rich in a wide range of nutrients including vitamins B6 and C, manganese, potassium, biotin, fiber, and copper. Since it contains sugar, it is recommended to feed it as a treat in small amounts and not as a regular part the diet. Bananas can also be difficult to digest. It is also important that you feed it in small pieces. Watermelons are safe for dogs to consume, but make sure that you remove the seeds and the rind. The fruit contains vitamins B6, A, and C, potassium, and low amounts of calories. A cup of watermelon has just 50 calories and is more than 90% water. It is free of fat and makes an excellent serving for your pet on a hot and dry day. There are some berries that your dog can eat and some that he shouldn’t. And he can certainly enjoy blueberries. These berries are rich in antioxidants, phytochemicals, and fiber which are great for your pet’s health. The low-calorie content further makes them excellent snacks because they will not cause weight gain. The antioxidants and vitamin C help in strengthening your canine friend’s immune system. Regular consumption can also slow down degenerative conditions and prevent cardiovascular conditions. Like any other food, it is recommended to give the berries to your pet in moderation. The high percentage of fiber in blueberries can cause diarrhea or other digestive problems if consumed in large amounts. Strawberries contain high amounts of antioxidants, making a healthy option for your dog. While it is fine to give it to your pet, you shouldn’t feed him more than a couple of strawberries. The fruit contains iron, potassium, magnesium, and trace amounts of calcium. It also contains fiber, folic acid, and manganese. Orange is considered an excellent fruit for dogs. It can be included as one of the ingredients in your pet’s main meal. The citric acid in the fruit is not toxic for your pet. Again, you should feed it only in moderation because the fruit contains a good amount of sugar. This is especially more important a point for puppies because they can have digestive system problems if the fruit is consumed in high amounts. It is suggested to serve not more than one orange to a large dog and 1/4 of a whole orange to a smaller dog. Carrots are considered healthy snacks for dogs. In fact, many veterinarians agree that you can feed them carrots almost every day. Among other benefits, the low-calorie food also helps in slowing down or preventing dental problems. Vitamin A Benefits: Carrots are rich in vitamin A, which is beneficial for overall health. It contributes to the immune system, bone growth, and reproductive system. The vitamin is also good for your pet’s eyes. Carrots further provide beta-carotene, vitamins B, C, D, E, and K, and various minerals including calcium, potassium, and magnesium in trace amounts. The phytonutrients in carrot are also known to protect the eyes from UV rays. Carrots work as healthy, low-fat treats for your pet. It is for anyone to overdo it when giving treats to their pet. When you choose treats like carrot, oranges, and watermelon, you will not have to worry about your canine companion becoming overweight. You can give him treats of lightly steamed or raw carrots. Pineapple is also a healthy food for your dog. It is not toxic or harmful to your pet in any way, unless he has some kind of allergy. The fruit is rich in a wide range of nutrients including vitamin C, vitamin B6, thiamin, niacin, folate, and riboflavin. It contains various minerals in trace amounts, making it an excellent addition to your pet’s diet. Consuming the fruit can help strengthen your pet’s immune system and improve the overall health. When feeding pineapple to your pet, you should take the basic precautions as with human consumption – avoid the core and the skin of the fruit. Eggs have been part of wild dogs’ natural diet for a long time. They make an excellent option for man’s best friend. They are rich in proteins that include a wide range of essential amino acids. It is best to serve eggs cooked or boiled. Eggs are not only nutritious and healthy snacks they can also help in addressing an upset digestive system. It is best to consult your dog’s vet about the number of eggs you can give to your pet. Make sure that your pet never consumes raw eggs. Raw eggs increase the risk of your dog contracting salmonella. If you feed raw egg whites to your pet for a long time, it can also cause biotin deficiency. It is best to boil or cook eggs without any additives like oil or salt. Eggs are safe for your canine friend, but make sure not to overfeed it. Broccoli is a low-calorie, high-fiber snack for your canine friend. It contains vitamins, iron, calcium, and potassium. Broccoli has sulfur-based compounds that may also help prevent the risk of cancers. It is also recommended by vets to add new foods slowly to your pet’s diet. This can help you determine problems like vomiting, diarrhea, or bloating. If you love to snack on cucumbers, you can also feed them to your dog. It makes a low-fat snack that is healthy and safe for your pet. Besides the high water content, it contains phytonutrients that provide antioxidant benefits. It is a low-calorie snack that doesn’t pose any risk of obesity even if consumed on a regular basis. You can give bread to your dog but it is important to consider which type of bread you are choosing. However, you should choose bread only if your pet isn’t allergic to wheat. It is also important that bread makes up only a tiny percentage of your dog’s diet. Choose a brand that doesn’t contain much sugar and it shouldn’t have any nuts or raisins. You should completely avoid certain types of breads such as raisin bread, banana bread, and onion and garlic bread. You can feed peeled and pitted avocados to your dog. It is considered healthy for your pet in small amounts. However, avoid overfeeding because it has anti-inflammatory fat. The fruit provides a wide range of nutrients including vitamins, minerals, and healthy fats. If your pet consumes a high-quality diet, there is actually no need for you to serve him avocados. While you don’t have to feed grass to your pet, it can often leave you confused when you see your canine friend eating it. If he eats grass often, it is a disorder that is referred to as pica. It can be caused either due to some nutritional deficiency or just because your pet is feeling bored. It is natural for a dog to eat grass and veterinarians usually consider it to be normal behavior. Since it can be a sign of nutritional deficiency, it is recommended to get your dog checked and make changes to his diet. The following foods are either bad for your pet or don’t add any nutritional value to their diet. Your pet is certainly going to love cheese, but this doesn’t mean that you should give it to him often. It doesn’t contain any nutrient that your dog isn’t getting from a normal diet. Cheese is rich in calcium, which your pet can have from milk and meat, but it also has high amounts of saturated fat. Cheese can increase the risk of digestive problems and diarrhea. Beer or any type of drink containing alcohol can be harmful to your dog. Humans have been taking alcohol in one or the other form for centuries. This has helped build some level of tolerance. However, a dog’s organs cannot process or filter alcohol and can get damaged. You should also know that dogs are physically smaller than humans and even a small amount of beer can make a huge impact on their body and mind. Grapes and raisins should be completely avoided for dogs. They are toxic to your little furry friends, however, researchers are yet to determine the substance behind the toxicity. Grapes can cause damage to your pet’s kidneys. Some of the other problems can include diarrhea, vomiting, dehydration, lethargy, seizures, and oral ulcers. The fruit (pulp) has been known to cause gastrointestinal problems in dogs. Cherry pits contain small amounts of cyanide that can prove to be toxic to your pet. Cherry pits can sometimes cause a serious problem called intestinal obstruction. Most varieties of lettuce have low amounts of fats and calories. The green veggies contain vitamins A and C, and trace amounts of iron and calcium. You can give lettuce to your dog but its low-nutrient content doesn’t make much sense from the perspective of health benefits. Spinach is a healthier choice compared to the small amounts of fiber and vitamins that lettuce can supply. Chocolates can be toxic and harmful for your dog. Even a small amount of it can make your pet ill. If your pet consumes chocolate by accident, you should immediately take him to a vet. It can cause diarrhea, shaking, excess thirst, or seizures. All types of chocolates, including white, milk and dark chocolates are dangerous for dogs. So make sure that your canine friend never gets near chocolate. 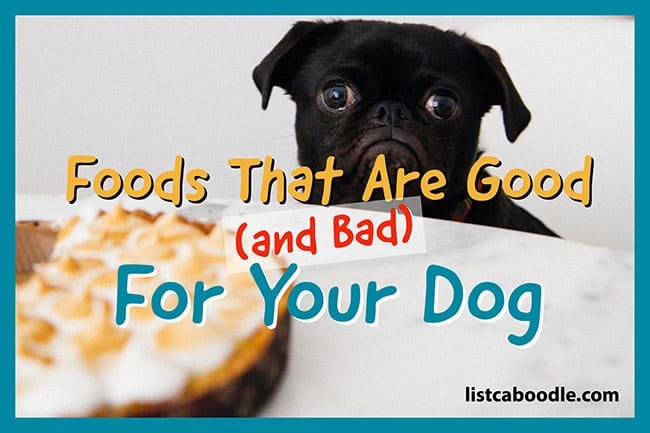 Now that you know which foods dogs can eat and which foods can be bad, you will be able to make better decisions when planning your dog’s diet. Remember, snacks and treats are always best served in moderation. And always check with your dog’s vet or clinic if you have questions about a specific food or questions related to your pet’s diet.